Brickset.com was launched in 1997 to keep track of the many promotional sets that were appearing at that time. Since then it has expanded considerably and is now the primary reference on LEGO sets on the internet. To find out more about the site's history, see the Brickset through the ages news article, published in Jaunary 2014. You may also find this article of interest that explains where we get our data from. Brickset is owned and operated by Brickset limited, a company registered in England, registration number 7754012. Huw Millington the main man behind Brickset. 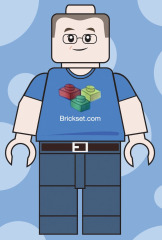 His roles at Brickset are to maintain the website and database code (he's the only one that does this), to continually evolve it to ensure it remains the best LEGO database on the web, and to keep it updated with news, set information, photos and so on. He's a founder member of the Brickish Association, the UK club for adult LEGO fans, and an ex-LEGO Ambassador (first and second cycles in 2005/6). When not working on the site or building with LEGO he enjoys photography and cycling around the Solent area of southern England, where he lives with his wife Maria and, when they are not away at university, two daughters. Huw is supported by a team of administrators, news correspondents and moderators. See the list below for more information about who does what. Brickset is free for everyone to use and, when you're signed in, is also free of distracting and unsightly advertisments and it is hoped that it can continue to be. The site is funded by advertisng and affiliate marketing. When you purchase something after clicking on a link to eBay, Amazon, LEGO.com, Argos or other merchants, Brickset receives a small commission. It's only small, but it adds up! Please read our affiliate marketing disclosure for more information. All Brickset reviews are moderated and we check them all before they are accessible on the site to make sure the content falls within the acceptable uses of Brickset, and is appropriate for a young audience. It is Brickset's policy to remove or obscure personally-identifiable information posted by a member such as physical address or phone number. News comments are not moderated before they appear; however moderators monitor them and move quickly to remove anything inappropriate. Should you encounter something you feel is inappropriate, please contact us. Brickset does not sell LEGO. It acts as an affiliate of LEGO, eBay and Amazon. All purchases are made directly with these companies. If you have an enquiry about products or orders from LEGO, please contact LEGO customer services. Site designed by Chris Sanderson. All programming, database design and development by Huw Millington. The following lists show who does what at Brickset. Can administer user accounts and access behind-the-scenes pages to maintain the site. Can add to and edit the main set database. Can post and edit front page news articles. Can edit and delete news article comments, queries and reviews. Can edit and delete BrickLists.